Mushrooms are surprisingly similar in taste and texture to meat when cooked, so they are the perfect ingredient for vegetarian veggie burgers! This vegetarian, vegan and gluten-free mushroom burger recipe may just surprise you with how tasty it is. While mushrooms provide plenty of flavor and texture, the addition of pinto beans makes this veggie burger recipe high in fiber and protein too. There's not much to them, other than that! Just mash everything up together, form into patties, heat and serve! It really couldn't be too much simpler, but, if you are looking for something even easier, my easiest homemade veggie burger recipe ever is these black bean patties made from just four simple ingredients and a few seasonings. Worried about crumbly veggie burgers? If you've tried making veggie burgers in the past and have struggled with them falling apart or being too dry and crumbly, you'll also want to check out these tips for how to make the perfect veggie burger. This mushroom burger recipe is both vegetarian and vegan as well as gluten-free. First, sauté the diced white or yellow onion and garlic in canola oil or vegetable oil for 3 to 5 minutes, until the onions are soft. Next, add the green onions, cumin, and the chopped mushrooms and cook for another 5 minutes, or until mushrooms are cooked. You can add a bit more oil if needed. Set the onion and mushroom mixture aside. Next, use a fork or potato masher to mash the beans until well mashed. You can also pulse them in a food processor until smooth if you prefer. In a large bowl, combine the mashed beans with the onion and mushroom mixture and add the parsley, salt, and pepper. Make sure the ingredients are well combined. Shape the mixture into patties about one inch thick. If you make them too thin, they may fall apart, but if you make them too thick, it will be more difficult to get them to cook them all the way through. Heat about two tablespoons of oil and cook each patty until the veggie burgers are done, about 3 minutes on each side. You can also use an indoor grill pan to grill your veggie burgers if you have one. The onion and mushroom flavor is excellent when grilled. Serve with your choice toppings! Veggie burgers need a binder to hold them together. You can use eggs, wheat germ, bread crumbs, oats, or ground flaxseeds mixed with water. Eggs are the most common and effective binder, however egg replacers work well for a vegan veggie version. Check to make sure that the recipe you use has a binder included in the ingredients list. If grilling, make sure that you oil your grill grates to prevent the veggie burgers from sticking. Since veggie burgers don't have the same natural juices and fat that a beef burger does, they have the potential to stick on the grates more. We recommend using tongs to run an oiled piece of paper towel along the grates. 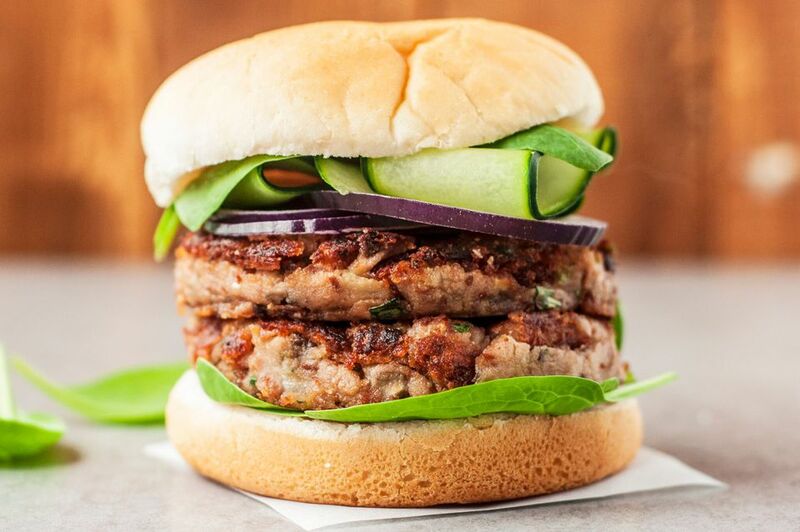 If you like making veggie burgers at home, check out more of the best easy homemade veggie burger recipes to try, including these spicy TVP Veggie Burgers, and the easiest ever Black Bean Veggie Burgers (one of the most popular vegetarian recipes of all time here at The Spruce Eats). Enjoy!